Many consumers who are thinking about going solar have heard the term “net metering” but aren’t sure what it means. 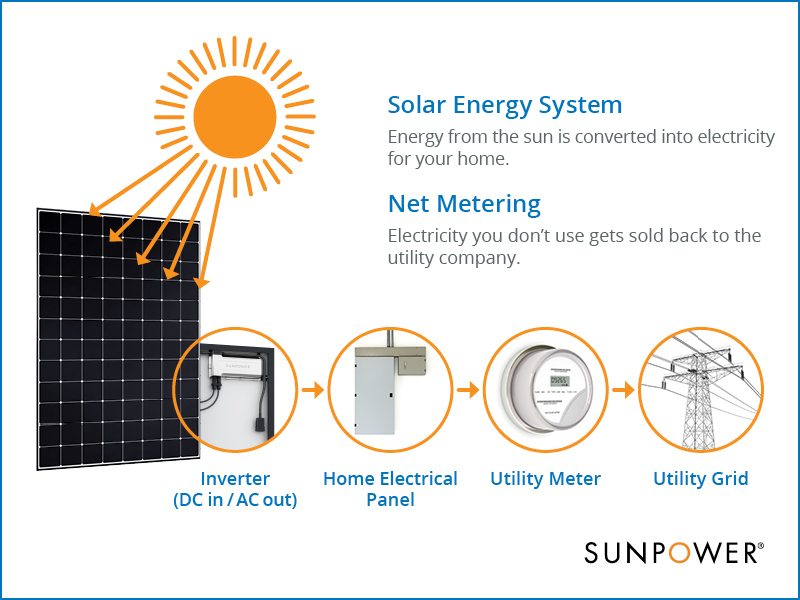 Put simply, net metering is a utility billing mechanism available in most states that offers a credit to residential and business customers who are making excess electricity with their solar panel systems and sending it back to the grid. When you have a rooftop solar system, it can often generate more electricity than you consume during daylight hours. With net metering, the homeowner is only billed for the “net” energy used each month, that is, the difference between the energy produced by the solar power system and the energy consumed by the house over the monthly billing period. Net metering can save homeowners hundreds of dollars on their utility bills every year, so it’s a good reason to make the money-saving choice and go solar sooner rather than later. There’s another benefit from net metering. Since your solar system is generating electricity near the point where it will be used, this reduces strain on the grid’s distribution and transmission infrastructure and minimizes energy loss from sending voltage many miles from the nearest power plant. While some claim that net metering represents an unfair burden on non-solar electricity customers, many net metering cost-benefit studies have found the opposite to be true. Does My State Offer Net Metering? Although some state regulators and utilities have proposed policies that challenge the value of simple retail NEM, there haven’t been many changes to the rules — yet. The original retail net metering policies were designed for areas with low solar adoption. But with California, New York and other states seeing rapid increases in the amount of solar that’s being installed, there will be changes coming in the next few years. California has already instituted what’s being called “Net Metering 2.0,” and at least one study has shown how there are reasons to be optimistic about the new policies compared to the original retail net metering approach used in the Golden State. To learn more about net metering and other related policies in your state, check out the Database of State Incentives for Renewables & Efficiency (DSIRE). Another resource for information about net metering, pro-solar energy policies and consumer advocacy programs is the Solar Energy Industries Association (SEIA), or ask your local SunPower dealer for the latest on possible net metering-related policy changes in your area. There are many discussions taking place across the country on how to evolve the current programs. Net metering updates may factor in such things as a more accurate valuation of the solar energy flowing into the distribution grid; rate structures that charge more for electricity at certain times of the day (or night) or look at where on the grid the excess electricity is being generated; credits at a wholesale rather than retail rate; and the impact of residential solar energy storage batteries. If you are already benefiting from net metering for your solar system, you likely will be shielded from any significant reductions — you will be “grandfathered” in, regardless of any changes that may impact the rate design of new solar customers. So, to take advantage of current favorable net metering policies, don’t delay going solar. Visit our Going Solar page to learn everything from how many solar panels you’ll need to how much solar panels cost.